Working with vinyl fabrics as we do, Celina has made the effort to find the best ways to speed each product through the process. If you’ve ever lifted a 20’ tarp by yourself, you can understand just how weighty even the lightest fabrics can be – now image lifting that fabric to seal on hardware at a stationary machine. It can get pretty tiring. The main and most obvious difference is the “traveling” portion of the name. A traveling welder moves the RF generator around the sealing table, which lets you arrange the material and dies without needing to lean beneath the platen to do so. This lets you ensure that the hardware and the dies you’re using are 100% aligned properly. It’s also beneficial if you’re working on sealing a larger panel’s worth of material. 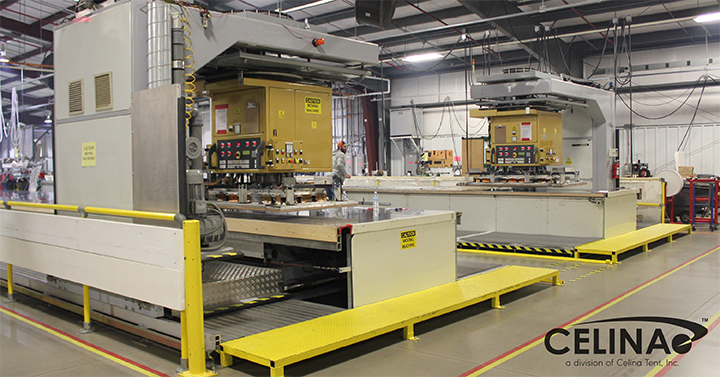 Under normal conditions, larger panels need to have the sealing portion lifted into the machine. This means a lot of arranging and moving to accommodate the stresses and tension that pulling on material in that manner will produce. Forsstrom tables are large enough to let full pieces be pulled up and arranged with little to no distortion. When talking about the sealing process, there are a few additional features that put the Forsstrom ahead of the pack (of our RF welders, not dogs or anything). Radio Frequency welding uses a current to heat up the material that is being pressed together. This heat does radiate out from the sealing area, and on most RF welders this heat can build up over the course of a shift and make the die or platen very painful to touch. The Forsstrom has a temperature control system that keeps the sealing area, either the platen or bar, relegated to a pre-set temperature during the sealing process. Not only does this make the platen touchable, but also helps to ensure that all of the seals are created under the same conditions. Operators don’t have to adjust the seal parameters to account for the heating platen or environment temperature shifts. Many of our largest products now run through the Forsstrom Traveling RF Welder, keeping our process times down and delivering you with your product faster. Want to know more about our capabilities and products? Give us a call at (888) 324-0654 or send an email to Sales@CelinaIndustries.com.